ESFJs are often called “The Protectors,”, “The Caregivers”, and “The Nurturers”, and it’s not hard to see why. Individuals of this type are known for their warmth and genuine interest in the lives and welfare of others. They believe in expressing their values, protecting the less fortunate, and creating a stable, structured life for themselves and their loved ones. 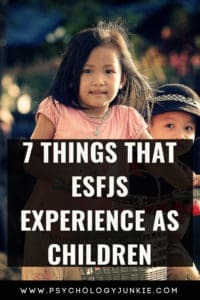 Today we’re going to take a look at some of the common experiences ESFJs encounter in childhood. ESFJs place a very high value on harmony in their environment. They have a natural ability to tune into the emotional atmosphere around them. This makes it easy for them to sense discomfort, anger, happiness, or sadness around them. Aggression, harsh words, yelling, and tension can all create a lot of inner turmoil for the ESFJ child. They may find themselves tailoring their environment so that emotional eruptions are less likely to happen. While this can be a good thing in moderation, parents of ESFJs should be careful to make sure that they aren’t inadvertently forcing their ESFJ child into a situation where they feel responsible for maintaining social equilibrium at all times. ESFJs are the children who flip over all their puzzle pieces and organize them by color before building a puzzle. They like knowing what’s going to happen and what order it’s going to happen in. Having to spontaneously adapt to a sudden, unexpected event can be exhausting to them. They want their parents to be clear with them about the schedule and prepare them for what’s going to happen in advance. At school they want to know exactly what’s expected of them and they want rules to be clear and consistent. Inconsistency, unpredictability, and vague expectations drive them crazy. Because ESFJs are so attuned to the needs of others, and because they so appreciate positive feedback, they tend to go above and beyond to take care of people. They are usually generous not only with their resources, but their time. They enjoy helping people in practical, tangible ways so that life can be easier. They especially are driven to help those they see as less fortunate. Unfortunately in childhood this can lead to friends taking advantage of them. Some people may demand too much or become manipulative, using emotional game-play to try to coerce the young ESFJ into satisfying them. Parents of ESFJs can help them by role-playing specific scenarios where the ESFJ might be “coerced” and giving the ESFJ words and statements to say to prevent being bullied or taken advantage of. Many descriptions of ESFJs give the impression that they are always bubbly and chatty and outgoing. While it’s true that ESFJs are very attuned to the people around them, they really do crave something intimate and meaningful. Quantity is far less important to them than quality. They want to be able to pour their authentic self into their friendships and nurture and protect the people who care about them. They are more than willing to stand up against bullies who go after one of their friends and they are deeply loyal to the people they bring into their lives. It is heartbreaking for young ESFJs to experience betrayal because they take the bonds of friendship so seriously. ESFJ children enjoy re-experiencing their favorite moments a great deal. As toddlers this can show up in them repeating the same joke or the same funny scenario so that they can enjoy everyone’s laughter a second time. As ESFJs get a little older they get a tremendous amount of joy from repeated rituals and celebrations. These can be anything from going through an Advent calendar at Christmas or having breakfast at IHOP every morning on their birthday. These kinds of expected, special occasions give them something to look forward to and create a sense of stability and comfort in their daily life. ESFJ children are extremely detail-oriented and goal-driven. They tend to enjoy hands-on projects and activities, but they also hold themselves to extremely high standards. They can get so lost in making everything flawless that they stress themselves out in the process. This is particularly true for school projects like dioramas or research papers. They have a very strong “inner critic” that notices every flaw and is inwardly berative at times. This critical voice tends to come out especially strongly when ESFJs are stressed. During moments of stress they may nitpick things they’ve done wrong in their past and feel like they can’t do anything right. Because the voice is often internalized, family members and friends might not realize this is such a problem. Parents can help young ESFJs by modeling contentment and not criticizing themselves in front of their children. They can also help by giving compliments about effort, willpower, and perseverance rather than just the finished product an ESFJ has created. Parents can also remind young ESFJs that nobody is perfect and it’s okay to make mistakes. Did you enjoy this article? Do you have any thoughts to share? Let us know in the comments! If you’d like to know more about your child’s personality type, you can sign up for our Parenting by Personality eCourse here. Hai susan! I have a doubt regarding my type development and I have send it as a message to your instagram profile @susiestorm984.. Please reply!! !